This article is about the Shop on the Main Island. For other uses, see Shop (disambiguation). Introduced in Update 3.2, the Shop is a small building located on the mountainside, underneath Chronos, on the Main Island. A glowing purple lantern hangs from a joist that is jutting out the front of the building and is complemented by royal purple and gold fabric banners hanging from the sides with a golden diamond emblazoned upon them. The structure is filled with crates overflowing with Gold, Gems, and Food. It has a slanted purple roof supported by wooden beams. 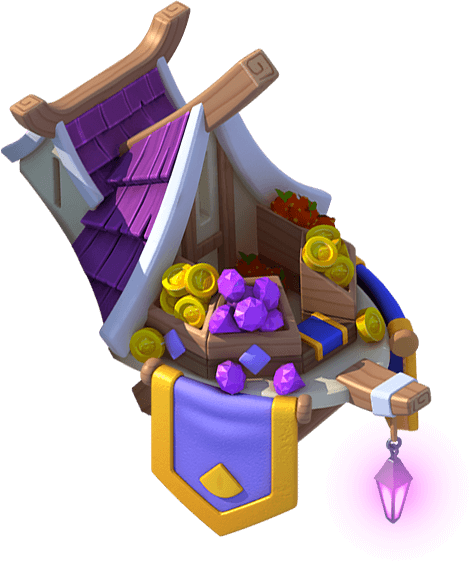 The Shop provides an alternate access point for purchasing Gems, Gold, and Food. Whenever there is a special offer for any of these items, selecting the Shop will take the Trainer to the respective offer. On some occasions, selecting the Shop will take the Trainer to a time-limited Main Shop bundle instead. The icon will be shown atop the Shop whenever such offers are available. When there is no offer available, selecting the Shop will take the Trainer to the screen for purchasing Gems. This page was last edited on 26 October 2018, at 18:06.